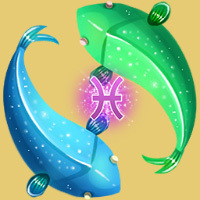 Pisces people may look forward to see plenty of positive changes in their lives in the year 2013. You may buy or build your own house this year. However, despite of great happenings all around you, internally you may not feel happy and contended. If you have been planning to move abroad for work or living, you may have to wait for some more time. Overall, the picture of 2013 seems positive, with some snags taking off the sheen. This year, you may be more sensitive than your usual self. Creativity may flourish. Earning power and cash flow are set to increase. Social scene for you may gain momentum. Domestic life will be peaceful for Pisces people this year. Those of you wishing to buy a new house shall be favored by the stars. Married people looking to extend their family may get to hear positive news soon. Parents shall be proud of their children. Bonds with parents shall get strengthened. You may even take a keen interest in the golden past of your family and ancestors. Time is favorable for arranging family outings and socializing. Friends shall come close to you and your family. In the year 2013, Pisces people shall come across someone who shall make them feel special. All the loneliness shall melt away for singles. A partner who understands you well and can bring colour to your life is just round the corner. Those of you already in a relationship may experience the glow waning from their relationship. Ones who are already married should focus on conception of a child as this year is conducive. Overall understanding and mutual support shall increase between couples. No major health issue for Pisces people is foreseen in the year 2013. However, as you are very sensitive, due to emotional upheavals, physiological functions in your body may get severely affected too. Mild health issues and seasonal disorders may be expected, but nothing serious. However, you will still need to be careful about your fitness, appearance and beauty. Overall, a good year for Pisces people as far as health is concerned. In the year 2013, Pisces people may experience a definite rise in their career prospects and success. The year looks to be especially progressive for service class people. New position, more power and more money can be expected. Hurdles plaguing business shall vanish. A new business partnership shall be advantageous to you. You should be careful with your financial investments. Stock market investments may be avoided. You may also spend on electronic gadgets and entertainment activities. Its a time to conquer, no matter how difficult things may appear at first. Your imaginative mind is always appreciated, however do not build castles in the year and lose touch from reality. Judge a person well before being close to that person.